I’ve just arrived in Antarctica for my 14th trip to the ice. I still love coming down to Antarctica but after so many trips and having to leave my wife and daughter at home for extended periods of time it is becoming harder to make these trips than when I first started doing them more than 20 years ago as a graduate student. 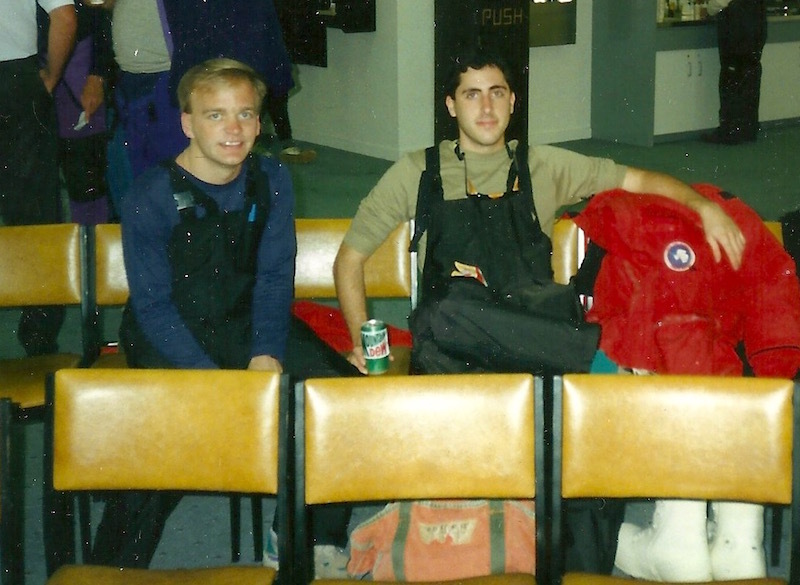 Here I am in 1994 waiting for my first flight to Antarctica. I’m sitting next to Mark Seefeldt, who accompanied me on my last Antarctic trip this past August. 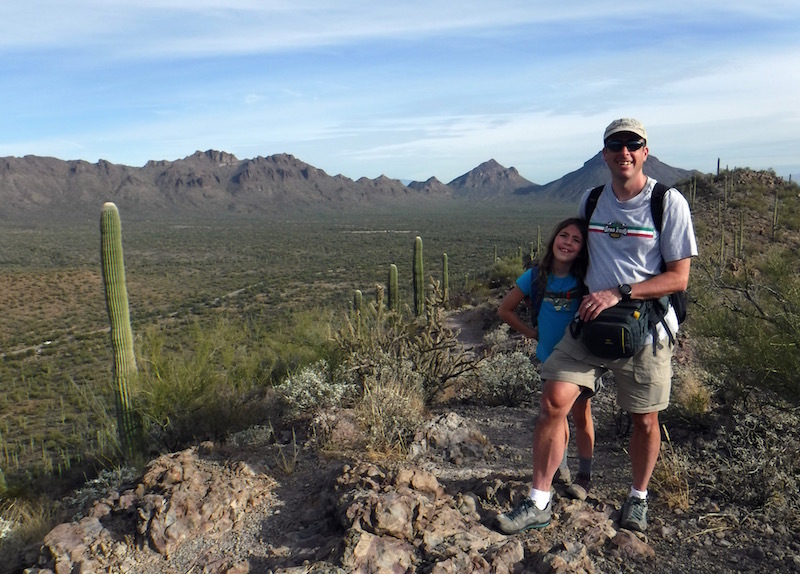 Here I am with my daughter Sabrina just over a week ago hiking in the desert outside of Tucson, Arizona. Having to leave her and my wife Liz is definitely the hardest part of going to Antarctica. One of the things that keeps me coming back to Antarctica is getting to have new Antarctic experiences. In 2009 I started making trips to Antarctica at WinFly (at the end of the Antarctic winter) rather than in the middle of the summer like all of my previous trips. Experiencing Antarctic winter conditions, with temperatures below -50 F, and seeing sunrise, sunset, and the night sky, including the Southern Lights, has been a highlight of these winter trips for me. 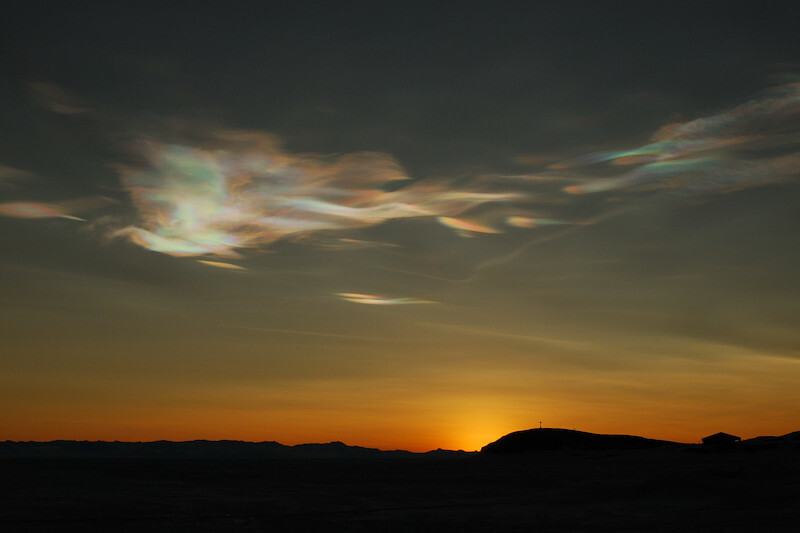 Polar stratospheric clouds at sunset over Hut Point, McMurdo Station, Antarctica – September 2009. 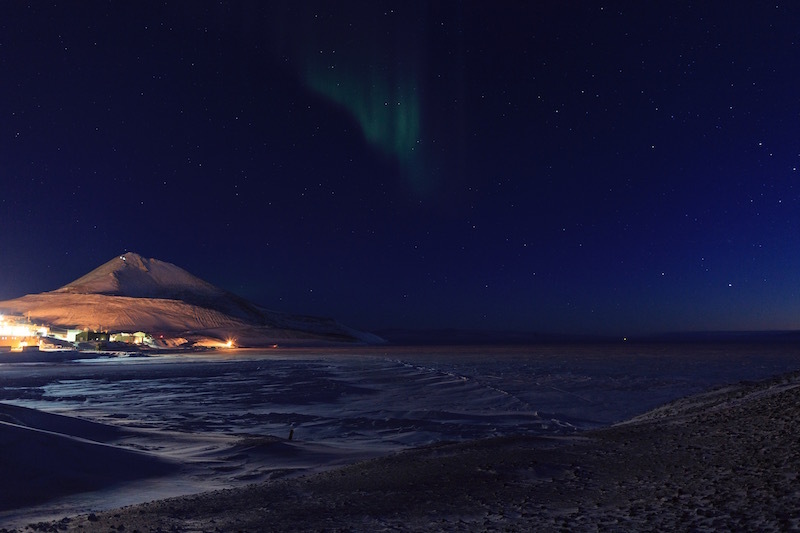 Night sky and Southern Lights over McMurdo Station and Ob Hill – September 2016. In 2014 I spent two weeks living in a tent at a remote field camp with just 2 other people, another new Antarctic experience for me. 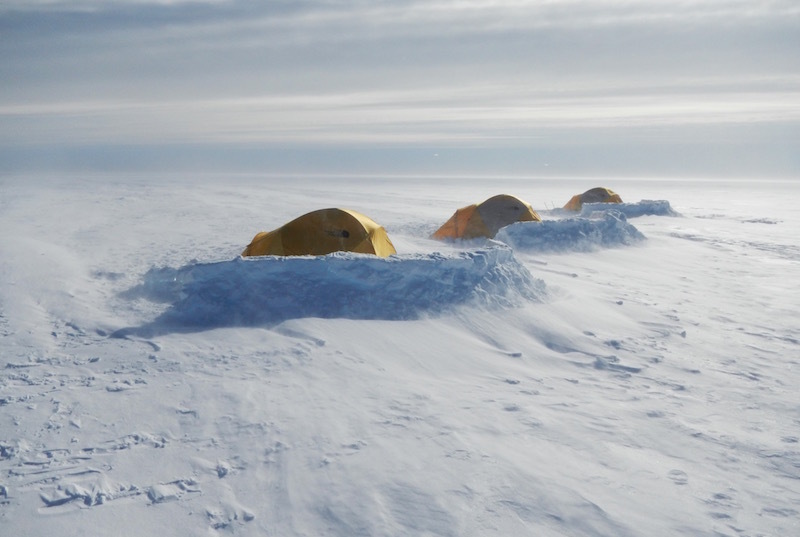 My home for two weeks in January 2014 – a tent camp on the Ross Ice Shelf. This trip ticks a couple of new boxes for me. First, I’m traveling and working with Antarctica New Zealand (AntNZ). This is the New Zealand equivalent of the United States Antarctic Program (USAP) and they support all New Zealand research in Antarctica. 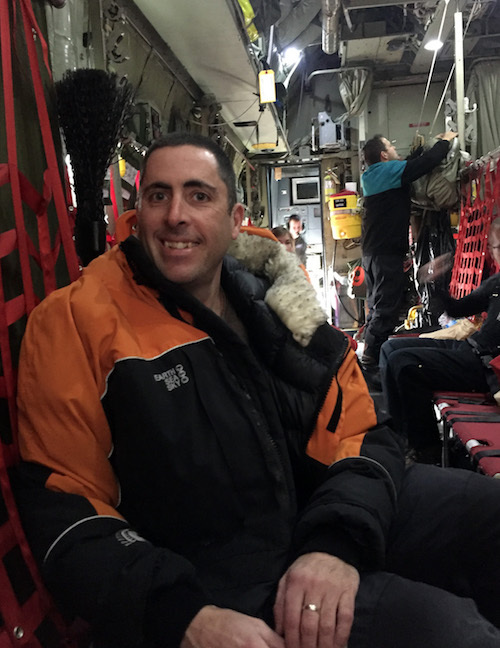 I’m an honorary Kiwi wearing the orange and black of the New Zealand Antarctic program on my flight down to Antarctica. While I was on sabbatical teaching at the University of Canterbury, in Christchurch, New Zealand, in late 2012 I developed working relationships with several New Zealand Antarctic scientists. On this Antarctic trip I’ll be working closely with two of them, Peyman Zawar-Reza and Marwan Katurji, to study the weather and climate of the McMurdo Dry Valleys by making weather measurements with our unmanned aircraft. I’ll describe the science we’ll be doing in a future blog post. This brings me to second new experience of this trip – visiting the McMurdo Dry Valleys (MDVs for short). 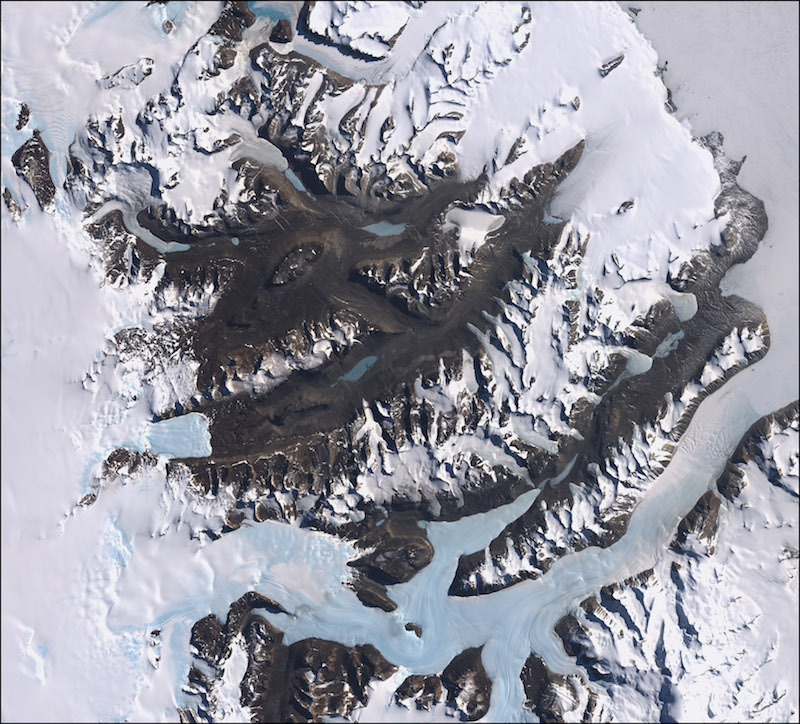 These are largely ice-free valleys in the Transantarctic Mountains, located across McMurdo Sound from Ross Island. This is one of the “holy grail” places to visit for people working in Antarctica because of their beautiful scenery. The MDV’s combination of rugged mountains, hanging glaciers, and a dry desert landscape makes for a stunning, otherworldly landscape. I am really excited to visit and work in this part of Antarctica. 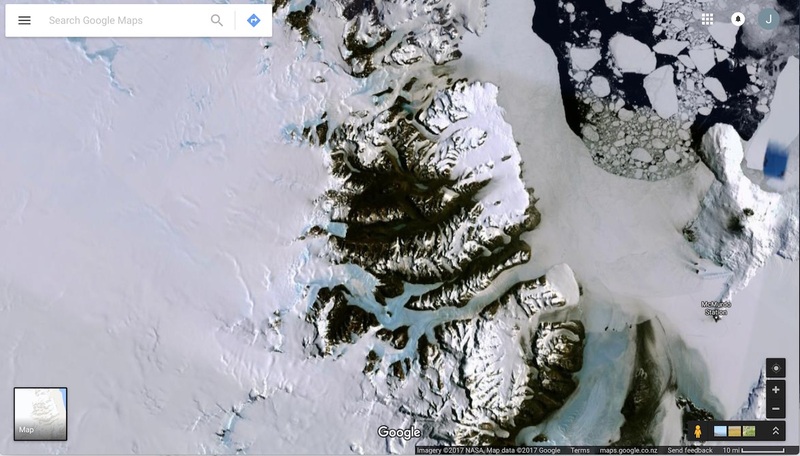 I’ll post photos of this unique landscape in a future blog post, but for now I’ve included a satellite image showing the valleys and the surrounding Antarctic ice sheet and sea ice. The MDVs are in the center of this satellite image. Their ice-free ground is shown by the dark brown color. The large white area on the left side of the image is a portion of the East Antarctic ice sheet, which rises to over 10,000 feet. On the right side of the image is Ross Island where McMurdo Station and Scott Base are located. Between Ross Island and the MDVs is McMurdo Sound, which is covered by sea ice in this image. This is a higher resolution satellite view of the MDVs. I’ll be based in Wright Valley, which is the central valley in this image. The light blue feature in the center of this valley is Lake Vanda where I’ll be living during this trip. After a very happy holiday season at home and a short vacation in Tucson, Arizona just before the New Year, I left for Antarctica on January 2nd. From Denver I flew to Christchurch, New Zealand via San Francisco and Auckland. This part of the trip took just over 24 hours from the time I left my home in Louisville, CO until the time I reached my hotel in Christchurch. I arrived in Christchurch on Wednesday January 4th, after having lost a day crossing the International Date Line during my flight to New Zealand. On Thursday I went to the AntNZ clothing distribution center to get kitted out with my cold weather gear for the trip. Much of this gear is similar to what I’ve been issued while working with the US Antarctic Program. The biggest visible difference is the color of our outerwear. The US program parkas are bright red and are affectionately called big red. The AntNZ outerwear is black and orange with a penguin and fern logo on the back. The penguin and fern logo on the back of my AntNZ parka. Another difference is that the AntNZ program provides two pairs of merino wool long underwear tops and bottoms and wool socks to all of their program participants, which we can keep at the end of our deployment. I’m pretty excited about this as merino wool is supposed to be one of the best materials for base layer clothing. The US program used to provide this part of our cold weather gear but in recent years they’ve required participants to provide their own base layers. After trying on all of my cold weather gear I took advantage of the nice weather in Christchurch to take a long bike ride out to the coast and to stroll through the Christchurch botanic gardens, where I tried to soak up as much greenery and color as possible before heading to the brown and white monochrome world of Antarctica. 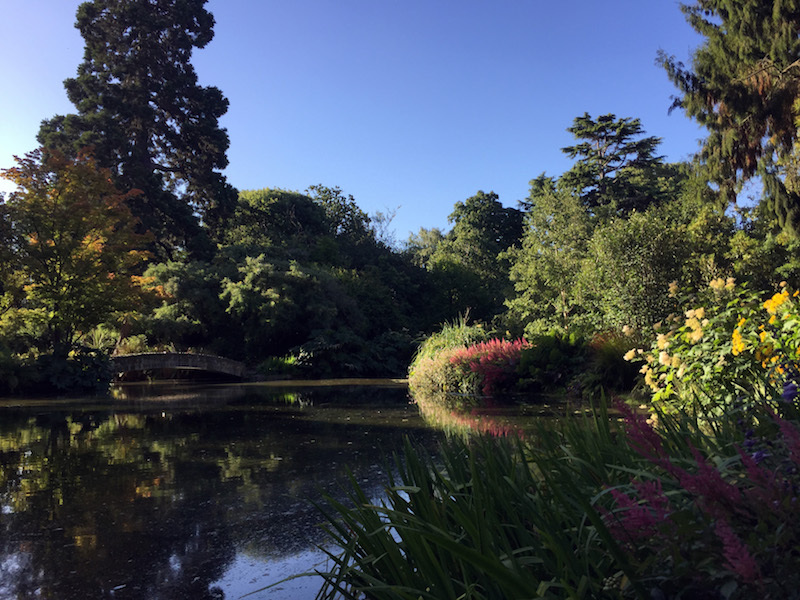 A pleasant summer evening in the Christchurch botanic gardens. 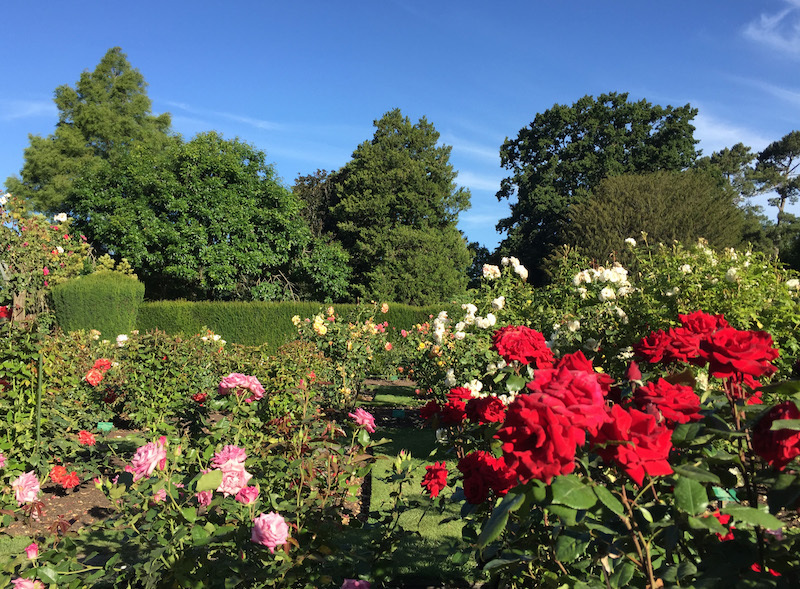 Rose garden in the Christchurch botanic gardens. 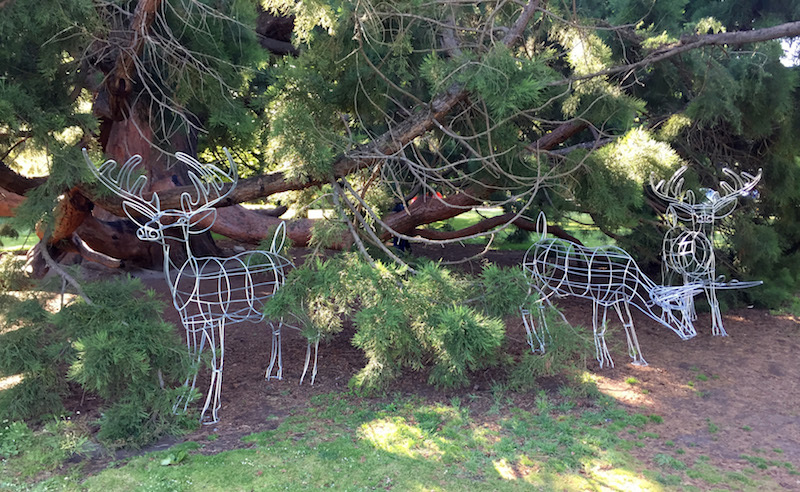 Christmas reindeer statues in the Christchurch botanic gardens. Even though I’ve spent a lot of holidays in the Southern Hemisphere it is still strange for me to see traditional Christmas decorations in a summer setting. As is often the case, the weather in Antarctica, wasn’t cooperating with the planned flights this week. When I arrived in Christchurch I was told that the flights that had been scheduled earlier in the week still hadn’t made it to Antarctica. I had assumed that this meant my flight south would be delayed by a few days, so I was surprised when I was told to report to AntNZ at the airport at 9AM Friday morning. Having been to Antarctica so many times I should have known that this was no guarantee I’d actually make it down to Antarctica that day. Instead I spent 7 hours waiting at the airport, with 60 other people trying to get to Antarctica, as the multiple flights scheduled for that day kept getting delayed. Eventually, two of the flights left for Antarctica, but my flight was cancelled at 4PM and I returned to my hotel near downtown. 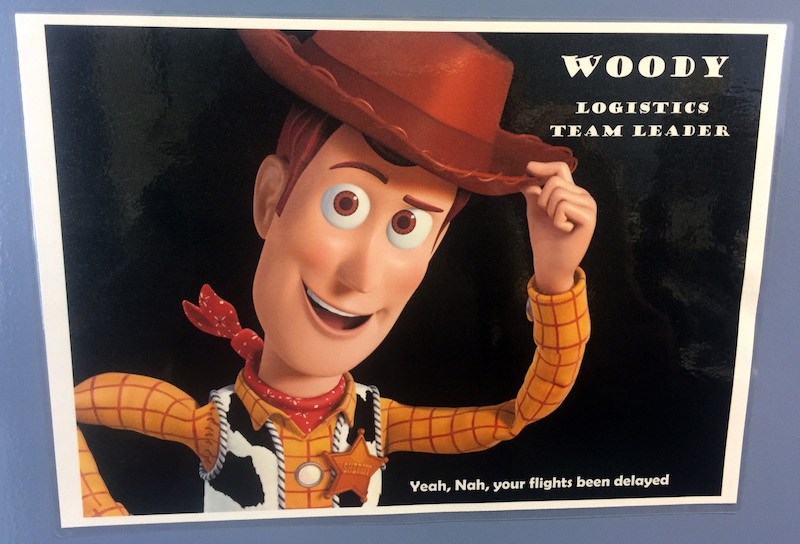 The AntNZ logistics manager’s name is Woody. This sign on his office door fit the bill for my attempted flight to Antarctica on Friday. 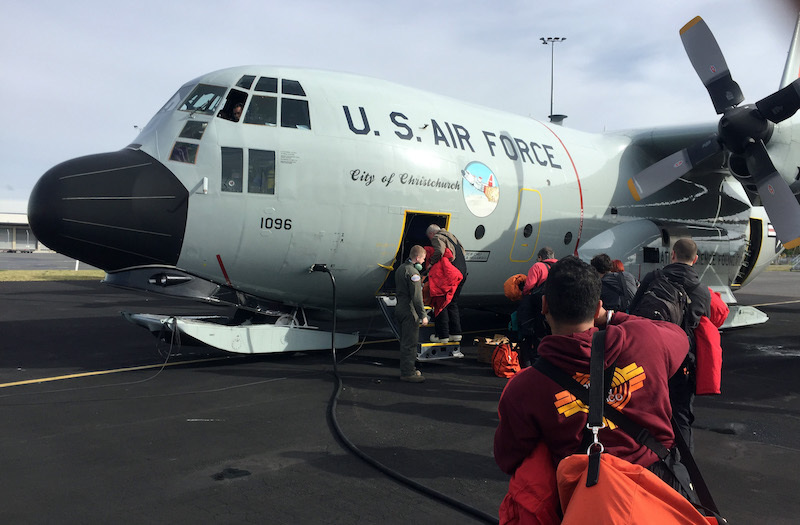 I returned to the airport at 7:30AM Saturday morning and without much delay was boarding an LC-130 ski-equipped military cargo plane for Antarctica a bit after 9AM. Boarding an LC-130 on the runway at the Christchurch airport. 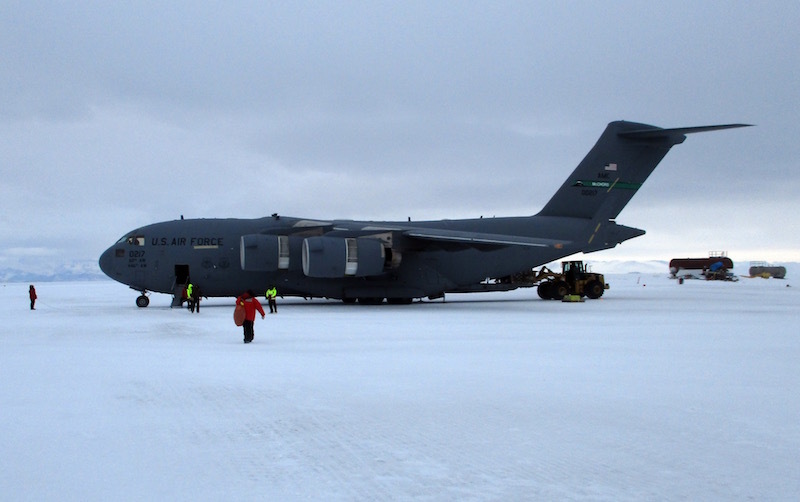 On my last trip to Antarctica, in August, I flew south on a larger, jet powered cargo plane known as a C-17. C-17 on the ice runway in Antarctica – October 2016. The C-17s are not ski equipped and need to land on a hard ice runway. During the middle of the summer the ice runway is too soft to handle wheeled aircraft and so all flights to and from Antarctica are on the smaller, propeller powered LC-130s. The biggest difference is that the LC-130 is a bit less comfortable and the flight takes 8 hours instead of 5. Often, the smaller LC-130s can be very crowded with passengers forced to sit knee to knee for the 8 hour flight. My flight wasn’t crowded with just under 20 passengers onboard. 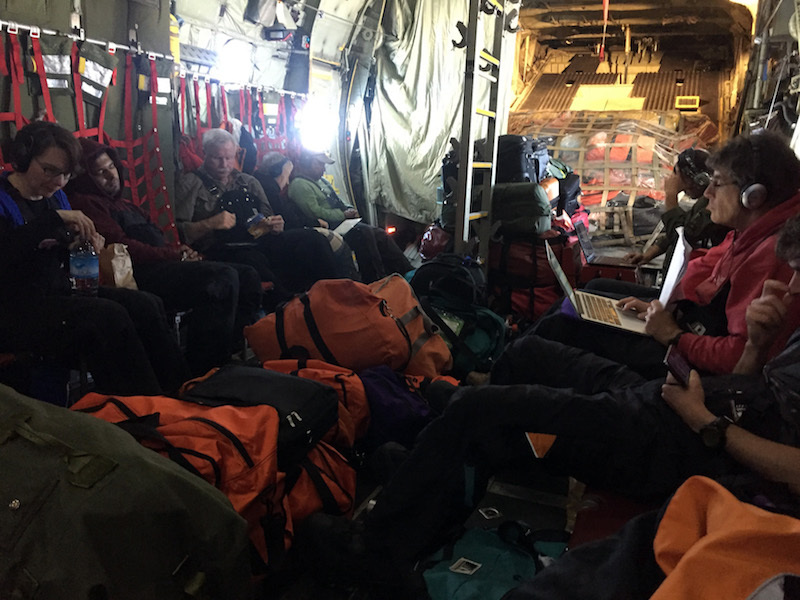 Inside a not so crowded LC-130 on the flight to Antarctica. My flight to Antarctica landed around 5:30PM Saturday evening. The first step out from the dark, windowless interior of the cargo plane into the vast Antarctic landscape is always one of my favorite experiences from my Antarctic trips. This time was no different. I stepped out to a bright, sunny, warm, and almost windless day on the Ross Ice Shelf. The massive volcanic peaks of Ross Island, Mt Erebus and Mt Terror, loomed to the north. After taking a few photos of our arrival, myself and my fellow passengers boarded a truck with large wheels for driving, and not sinking into, the snow road to Scott Base. 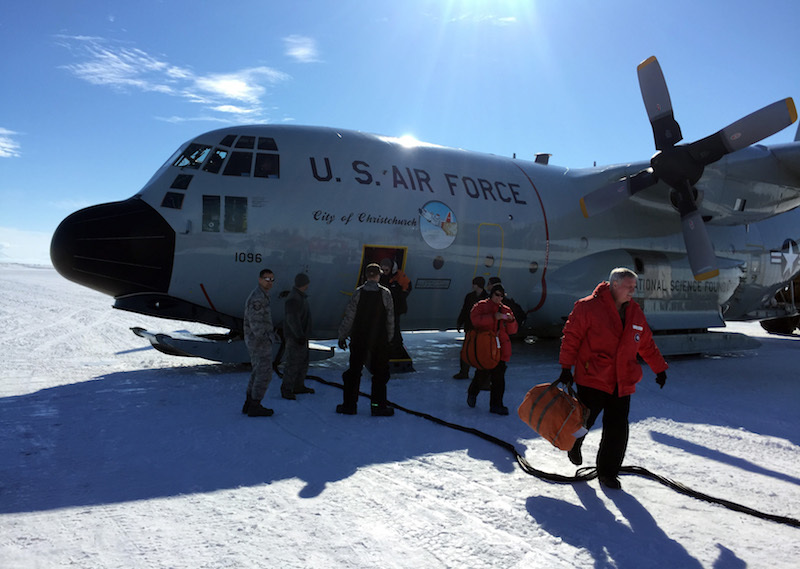 Disembarking from an LC-130 on the Willie Field snow runway near McMurdo Station, Antarctica after an 8 hour flight from New Zealand. In my next post I’ll discuss what life is like at Scott Base and how it differs from my previous trips living at the much larger McMurdo Station. Hi John – Have a great visit! I have alerted readers of my Twitter of your excellent weblog posts! Looks fantastic. One place I’d love to but will probably never get to see. Have a good one, enjoy. what about the ice shelf that is suppose to make the biggest iceburg ever/ any thoughts or comments? Very much enjoyed your blog post. Thanks for taking time to do it. Hi John, How did you find the new Phoenix airfield…smooth landing ? after 18 months of hard labour the guys are so proud of their new airfield.. Unfortunately I didn’t get to try out the new runway – we landed at Willie Field. Maybe I’ll get to try it out on my flight north in a few days.